About a week ago I was strolling in my mother’s orchard, perched above 600 m on a hill overlooking Beirut when I came across an artichoke bush. Unnoticed, the heads had remained uncut. I filled my bag with as many as I could. They were perfectly shaped and had crisp and vibrant green foliage. When I got home I hesitated for moment, wondering which way to cook them and finally opted for a dish we used to eat at my grand mother’s: artichoke hearts with meat and pine nut. This is food which requires patience and time and most people now cook it with frozen artichoke hearts. Back in the kitchen, I covered the table with newspaper and filled a large bowl with water and lemon juice. My mother and I sat at opposite each other and as we chatted we snapped the leaves off until we reached the hearts. We cut the stems short and removed the hairy choke using both a pairing knife and a spoon. We then cut around the edges of the artichoke and placed it the lemony water to prevent discolouration. I then bundled the discarded leaves in the newspaper and placed the lot away in the bin. 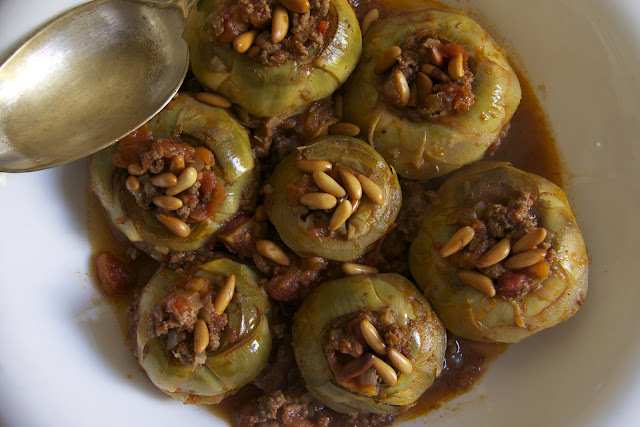 Neither of us could however remember my grandmother’s exact recipe, but in our minds remained the souvenir of buttery nests filled with minced meat and pine nuts cooked in tomato sauce. I prepared the sauce like a bolognese with spices and left it to slowly simmer before adding the hearts and allowed them to soften for about 25 minutes. I finally served them with vermicelli rice. The result? Delicious artichoke hearts which melted in the mouth combined with soft and spicy mince cooked in a rich tomato sauce with toasted pine nuts. 1. Sauté the onions in a little olive oil and salt until soft and translucent. 2. Add the mince beef and brown all over while tossing it in with the onions. 3. Add the spices and the bay leaf. 4. Add the peeled and chopped tomatoes together with tomato paste and water. Bring to a boil, reduce the heat and leave to simmer for 20 minutes. 5. Meanwhile toast the pine nuts in a hot oven at 180°C for 6 to 7 minutes. Set aside until ready to use. 6. Carefully insert the artichokes in the meat and tomato sauce, cover with a lid and leave to cook for a further 20 to 25 minutes or until the hearts are soft when probed with a knife tip. 7. Add the pine nuts about five minutes before cooking ends. Allow the stew to rest before serving in a deep dish rearranging the hearts with some filling in the middle and sprinkling with more pine nuts.